The Weather Guy: Rainy Day! It's Friday! I've been off work since Thursday afternoon before Christmas. Been the fastest 7 days of my life. I go back on Monday, December 31st for a day before getting Tuesday off. Rain is falling now over much of Middle Tennessee. Showers are racing to the northeast at 55 mph. The forecast calls for a 100% chance of rain (makes sense since it is raining right now!) today and 50% tonight. We continue to watch a developing winter weather situation for just after the first of the year. While it is definitely going to be much colder, we are holding off on the precipitation for right now. I hope to have a much clearer picture for everyone by tonight. 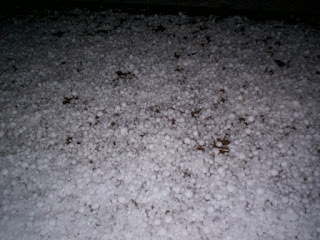 There are hail pictures from Decaturville, TN over at News 2's Weather Site. Some in the Middle TN area are reporting a lot of lightning..none here in the Cookeville area.